This method is productive for both salmon and steelhead as well as trout and smallmouth bass. Whenever the fish are actively feeding at the surface, the riffled fly may be fruitful. At times of giant stonefly and golden stonefly egg laying flights, the riffle hitch affords an enticing action. Stoneflies commonly sputter along at the surface during egg-laying. Tippet is attached by an improved clinch knot. To re-direct the tippet, two half hitches are placed out at a right angle to the fly's shank. These half-hitches are tied onto the fly's head. Using several mends, slow or speed up the fly's descent while maintaining some direct line tension to the fly. 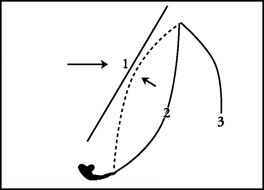 As the fly swings through the arch, watch for a possible strike. Many times interested fish may show themselves by boiling the surface. Fish the drop down area by jigging and pausing the fly to entice any reluctant fish. Next step-down and recast the fly; in this way the entire surface is fished. The choice of a fly pattern influences the fly's waking action. Flies tied with Muddler minnow head styles or with stiff hackles and hairs generate more surface disturbances. Additionally, waking flies should be tied with buoyant materials to help keep them afloat. 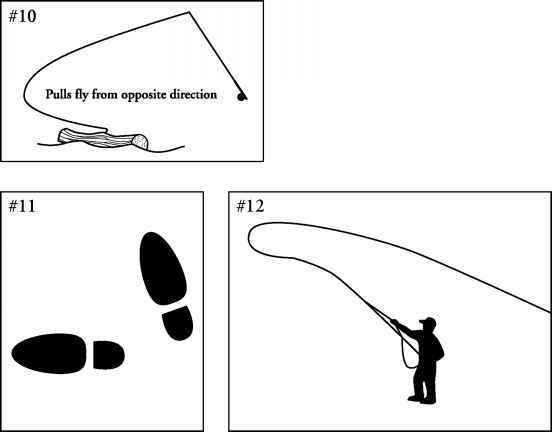 How to fly fish with the riffle hitch? How to tie a half hitch for a waking fly? How to fish a riffli hitch fly youtube? How to tie waking flies? How to fish the riffiling hitch?